We love our hamburgers, hot dogs, and popcorn, don’t we? To tell the truth, we love all kinds of food! Pizza and pretzels are high on the list too. Which is your favorite? Whatever it is, you can probably have it on your Christmas tree if you wish. Tacos, sub sandwiches, and French fries are here as well. There is a food ornament to satisfy every craving! Fast food ornaments and fruits and vegetables ornaments can also be found on this page. Food themed Christmas ornaments would make cute gifts for the foodies on your gift list. If you need a small gift for a gift exchange or something like that, an ornament is perfect! Ornaments are also good to tie up in the bow on gift packages. It adds color and value to your gift. 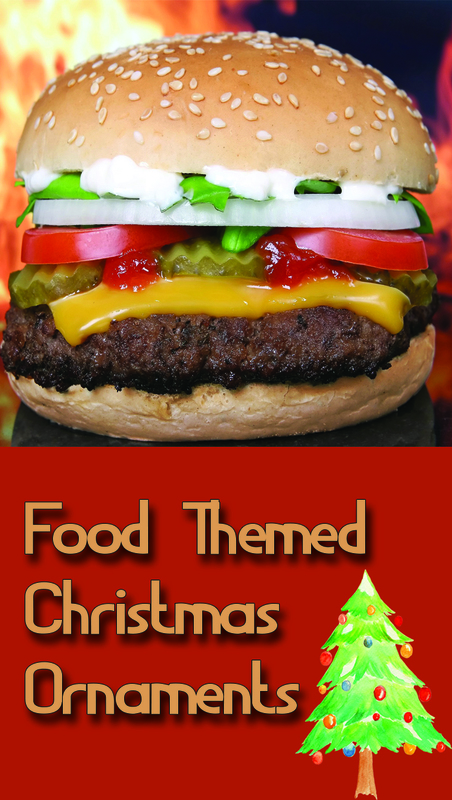 Here are several fast food ornaments from hamburgers to pizza! If it’s sweet things you like, scroll down because they have their own section! Beautiful, colorful fruit Christmas ornaments for your tree. Fruit is a traditional gift at Christmas time, whether it’s a fruit basket or an orange in your Christmas stocking. If it’s sweets that you prefer, we have doughnuts, ice cream, cake, cookies, pie and more. Whatever sweet treats your heart desires are probably here in the form of food themed Christmas ornaments. Donuts, ice cream, soda, candy bars The food themed Christmas ornaments make sweet little gifts for your friend with a sweet tooth! Beautiful small Christmas trees for displaying your special collections of ornaments. These trees can be put on a table in any room of the house. Small trees would be cute Christmas decor in a restaurant, bakery, bar, deli, or any other food establishment.